Lately, I’ve been trying to figure out what my WHY is and what will keep me motivated on a daily basis. For the past 6 months now (actually, more like a year or two,) I’ve been stuck in a so-called “rut,” and I am just sick and tired of feeling sick and tired! I’ve had a tough time sticking to my workout routine as well as my nutrition plan, which I believe has mostly been due to mega stress, as well as a depressive state of mind. I’ve spent a lot of time alone and have done a lot of thinking and I now officially feel like I’ve finally come to terms with it all. I believe I’m ready to get out of my own way and crawl out of this dark hole. I don’t care if I have to crawl out of it slowly and painfully, inch by inch; I’d rather do that than stay where I am at! The process of crawling out of my rut began the day this blog was born, about a month ago now. I didn’t really know how to “blog,” but I decided it was worth learning more about. I have actually tried to start a few blogs (on completely different topics) here and and there, over the past two years, but to no avail. If I wanted this blog to be more successful than the others, now was time to finally do some research on how to do it, in order to “learn the ropes” and to hopefully shorten my learning-curve time. So I took a week out of my schedule, did a bunch of research on blogging and how to monetize it, finished designing the prelimnary layout of it (it will probably get better in time,) and then I just started writing. I didn’t try to get it “perfect” the first time and I made a decision from the beginning to just let it grow organically along with me. I’m going to figure out how to blog while I also figure out how to pull myself out of a rut. About 3 weeks into blogging, I decided to write out what my dream life would be like. How I’d want my life journey to ultimately go. How I’d want to inspire people. How I’d want to be remembered. What my current excuses and fears were. And with all that, I suddenly saw it. I saw my VISION. I saw what could happen, and I saw how I could make it happen. I started to write down my plan on how to reach those dreams/goals and make the vision inside my head become a REALITY. I can’t really explain how all of this happened, but I can tell you, writing it down helped knock out a couple of bricks in that big protective brick wall I’ve surrounded myself with. I built that wall up about 2 years ago, after going through an emotionally traumatic event. I was afraid of feeling any kind of emotion, as well as exposing my vulnerable side, in fear of being hurt again and thus feeling additional pain. I just couldn’t handle it. Trusting anyone was out of the question and so I closed my true self off to pretty much everyone. On top of all that, I was sad and I was angry. SO angry. Once I knocked out the first couple of bricks, some more self-discovery came along. Not only did I put up a brick wall around me to block everyone out, but I also fell into a deep, dark hole and have been stuck at the bottom of it, sinking into a pool of quicksand. I’ve been down here for quite a while, just trying to keep my head high enough so I can breathe. As I tread, I’m also fighting a constant battle with my mind, trying to decide whether I have enough strength yet just to try and figure out how to climb out or if I should just stay in here for a little while longer and hope for something to come rescue me. Time keeps passing, and my arms are getting tired. Of course, no one knows I’m down here, because there’s a protective wall keeping them all out. I’ve done this to myself and as more time passes, I realize that no one can save me BUT myself. So I ask myself again, “Can I muster up enough strength to pull myself out of here?” I think about it for about a week and come to a conclusion. The answer: Yes. Why? Because I’m not the type of girl who needs to be saved. I know I’m stronger and more independent than that. It doesn’t matter how much pain or how much time it takes. I’d rather pull myself out of here and face my fears than spiral further down into my own abyss. I simply don’t want to stay down here anymore, dwelling in my own misery. 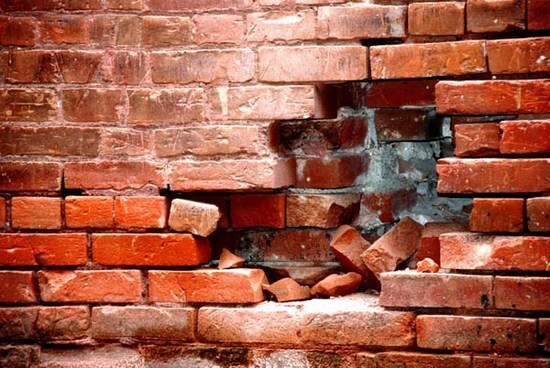 I want to fight my way back into the light and plow down my brick wall! I want to feel everything again! I want my confidence back! I want my happiness back! I want my strength back! I want my happy-go-lucky spirit back! I want to learn to trust again! I want to inspire others! And most of all, I want to succeed in everything I set out to do in this life!